I believe that in order for our children to have a true awareness of the importance of preserving the planet they must connect with the natural world on many levels. For my part, this is possible through working with one of the most versatile mediums available to us. Both sustainable and readily available locally, I would like to introduce you to the wonderful world of willow! How and what? There are various workshops available that can be tailored from KS1 right through to KS4. I am happy to discuss any specific requirements that would suit your particular establishment. Some ideas are listed below. I plan to add more willow sculpture into my program in the near future and more items will come available as I widen my portfolio. I’m always up for new ideas! For a detailed list of what is available and the suitability for certain key stages please see here. You can also see details of some bespoke projects that I have worked on with schools. Seasonal – Festive workshops: various stars and spiral decorations to sell at a Christmas fairs or as gifts for family, festive wreaths. evening making wreaths and willow decorations with a glass of mulled wine is a great way to enter into the festive spirit! Or at any time of year for other items such as hearts. Art/activity weeks – If your school has a set period of time for art or activity weeks, willow weaving could be incorporated into that. 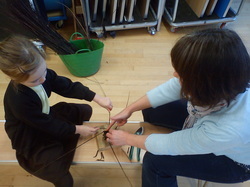 Flowers, dragonflies and butterflies can be attempted by older pupils amongst other things. Why? Throughout my experiences, I have always been aware of how children are attracted to the willow and enjoy working with it. I have realised it can actually benefit a child’s psychological well being and enhance their spiritual and emotional development. Working with natural materials in natural surroundings can have a positive impact on pupil progress by increasing self esteem and allowing pupils to think and work creatively. Bringing nature into the classroom goes hand in hand with outdoor learning and these workshops can be tied in with forest school activities. Working with volunteers: Depending on which curriculum stage, some parent volunteers may be needed to assist. Not generally a problem to recruit! ¾ hr to 1 ½ hours should be adequate time for any volunteers to feel proficient enough to assist the children 1:1; This can be done before the planned workshop, if time allows, or on a previous day if necessary. I do have an assistant who is available to help with older age groups if needed. General format: At the beginning of any workshop I give a short talk to suit the relevant age group. I feel it is important for anyone who is working with the willow to understand a bit about the natural history, the method of cultivation and its uses over the years. Depending on numbers and time I will either give a demonstration then or to smaller groups throughout the workshop. Incorporated into this talk will be a few health and safety rules regarding tools and the importance of awareness of personal space when working with the willow. available. Domes, tunnels, arbours, fedges, let your imagination flow! 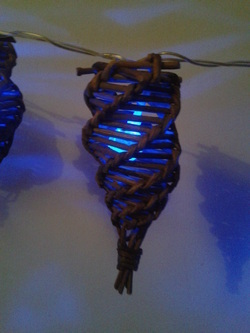 Take a look at my living willow page to see more images of recent projects. Domes can be large enough to be used as an outdoor classroom. 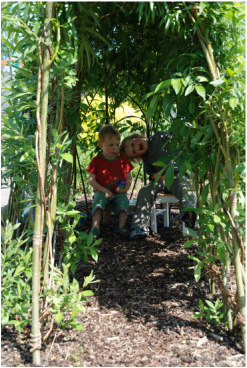 Story time on a sunny afternoon in a living willow dome can be magical for a small child. The nature of the work involved to create a living willow structure makes it suitable for year 4’s and up. For younger children parent volunteers are generally required to assist. Again not normally a problem to recruit! When the children are involved in the construction it will often help with the ongoing care and respect for the structure as they feel a level of ownership and will encourage others to do the same. Living willow structures do need ongoing attention. I will return the following season after the leaves have dropped to show how to prune and manage the structure at no extra cost. After that I suggest a designated person takes control or it will run away with you! I can always be on hand for advice or ongoing care at a reasonable rate. The season for living willow is generally January to March. This can vary slightly due to weather conditions. Willow can be planted outside these times but it is not ideal. began running workshops two years ago, and have experience of working with a wide range of people in different settings. DBS: I have a current DBS and I am subscribed to the update service. Cost: Suggested group sizes vary on chosen items for different age groups and how many volunteers there are. The following is a guide; final cost will be agreed on booking. Working alone I would need to have smaller groups therefore lengthening the day. Alternatively I work with my assistant with larger groups or parent volunteers. PSA fundraiser – 2 hr workshop up to 20 people £100 including materials. Please contact me for a price for smaller groups.